The Indian Health Minister, Kaul Singh Thakur has declared that the state government will provide free antifungal medicines to below poverty line patients. 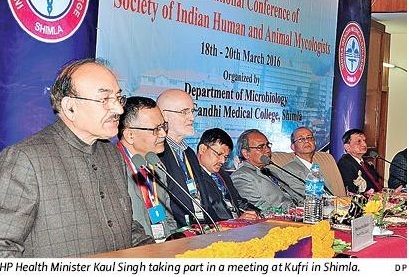 Speaking at the 11th National Conference of the Society of Indian Human and Animal Mycology at Kufri, the minister said the government was committed to include the common fungal diseases component in planning, budgeting and human resource development at primary, secondary and tertiary levels of healthcare. He promised that anti-fungal drugs would be provided at affordable costs to common folks and free of cost to the Below Poverty Line (BPL) patients.The minister called upon the expert group of Mycologists at the conference to deliberate on establishing national network of mycology laboratories at all levels of health care, including model research centres for diagnosis management and research in the field of mycology. Introducing the issues, Director, Medical Education and Research, Dr SS Kaushal said the fungal diseases were being ignored in the country for lack of awareness. Mr Thakur said the state government would take up with Union Ministry of Health to formulate national strategy for control of fungal infections across the country.“Fungal diseases have been ignored so far and the country does not have any National Control Programme on this”. He indicated that the data on the burden of fungal diseases in Himachal Pradesh and the whole country was not clear. However, the climate in the country as well in the state was well suited for a wide variety of fungal infections.He said within the limited data available, an increased incidence of opportunistic fungal diseases has been reported. The conference is organised by Department of Microbiology, Indira Gandhi Medical College, Shimla and a large number of mycologists have converged in Kufri from India and abroad to participate in it. He said the commonly encountered fungal diseases in HP were sporotrichosis, dermatophytosis, fungal eye and nose infections. However, the increase in immune compromised states like diabetes, alcoholism, organ transplantation, cancer and HIV have increased the likelihood of fungal infections, which is a problem in the state. The minister said the surveillance mechanism would help the health department take necessary decisions to improve clinical training and technical competency for diagnosis, management and treatment, also therapeutic innovations and infrastructure development for combating fungal infections.